Welcome, and thank you for visiting Supporting Aussie Kids with Kabuki Syndrome Incorporated. SAKKS is a voice for Kabuki Syndrome, and if you are visiting for the first time because your child has been recently diagnosed with Kabuki Syndrome, know that you are not alone. Kabuki Syndrome is rare, and a difficult journey for our parents, remember, a diagnosis gives answer to the symptoms your child experiences, not the person your child is or will become. Every parent will deal with a diagnosis differently, and even though Kabuki Syndrome is a relatively new syndrome, Geneticists and Counsellors have heard of the Syndrome and can offer support. Many General Practitioners aren’t usually aware of Kabuki Syndrome, however they are always keen to learn more, as are other health care providers, and we offer plenty of information on our site to assist with this. To help support those affected by Kabuki Syndrome, we, (Peta and Adrian), created this website in 2004. We hope to offer comfort and support to other families just like ours. By joining our membership you will receive the latest information, newsletters and contact with other parents. 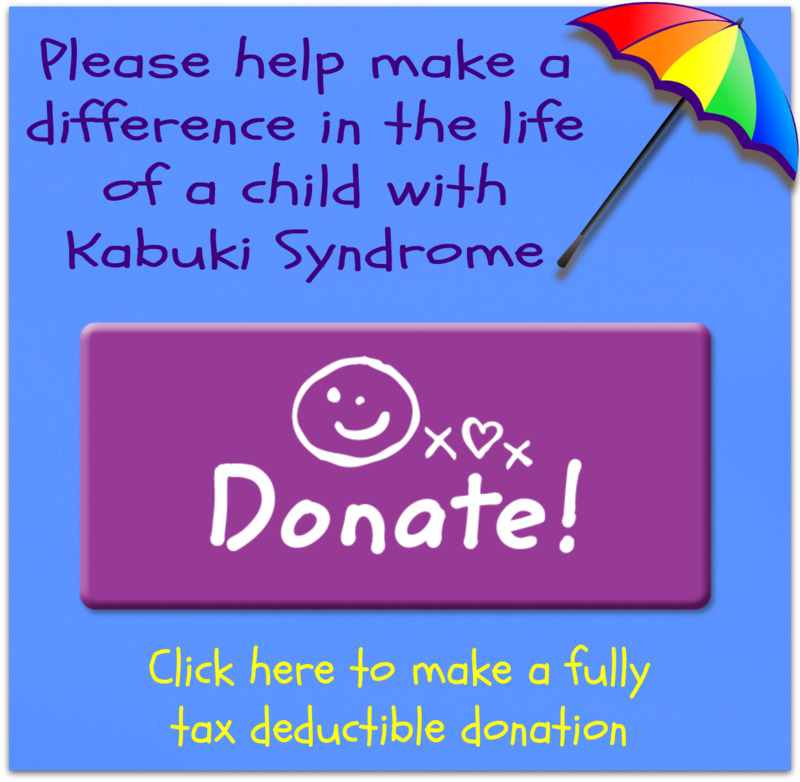 Who is Supporting Aussie Kids with Kabuki Syndrome? We are a registered not for profit charity who support families/caregivers who have a child with Kabuki Syndrome. We offer information, external links to genetics departments and research as well as links to medical information. A stories page with personal accounts describing many of the challenges of coping with a child that has Kabuki Syndrome. We also display members photographs, facilitate contact with other parents, sibling information, early Intervention and educational links... and of course - support. We host 3 day retreats, educational seminars and family days for families who have a child with Kabuki Syndrome. Membership for family members including siblings and membership for professionals to aide in information sharing. SAKKS currently has over two hundred members from every corner of the globe. SAKKS is only successful because of its members – and we say thank you to those who have become members and supplied stories and photographs.